Hey y'all. I'm running into a little problem. Can y'all please help? I am reading values from an instrument and trying to plot these values continuously when the push button (converted it to a toggle button) is pressed. I am using Guide for my GUI. please note that the code isn't complete yet, but I am testing the real time plotting at this point. I'm not sure how to get the while (when pressed) condition for the push_button. Also, I took the section of code within the loop to a seperate file and was able to plot it. However, Matlab plots one point at a time and I was not able to get it such that it connected the points. Note that instead of using a while loop, you could use a timer. 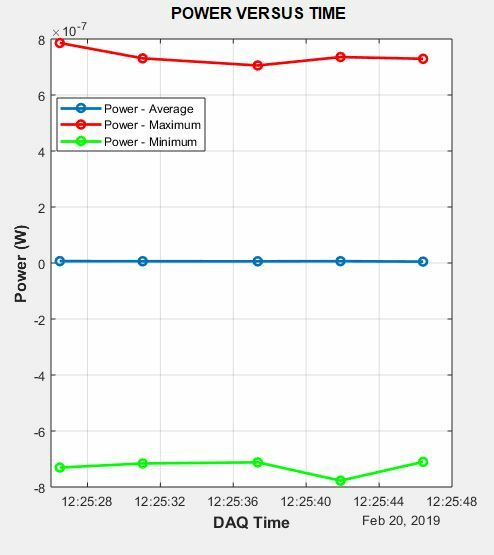 See How to plot a real time signal with axes automatically updating for an example. All inputs must be datetimes or date/time character vectors or date/time strings. I modified the code slightly (shown below) to see if I would able to plot only the data obtained from the instrument continuously without errors. though I suspect there are smarter (more efficient) ways to do this. You could grab the xData and check to see if the size is 1 and the first element is NaN (use isNaN perhaps?) but in the end, the result is the same: for the first iteration, just set the x- and y-data to be the data retrieved on that iteration. For every other iteration, update the existing x- and y-data. I see that your while loop condition is always true. Is this intentional? How would you exit this loop? Per my while loop being always true, this is intentional for now. I am just trying to get the continuous plotting going. When I have the plotting going, I plan to have the while loop based on the push button (When depressed, run loop). I'm currently trying to figure out how I'll do that. Is the error because grab_avg_time is a datetime object? What are hoping to show along the x-axis? A string of the date? Could you convert it to a serial date number instead (with datenum)? Not sure. I implemented a similar plot in another section of the code. The loop for this plot is a for loop that collects a certain amount of data and plots as such. so that we now create a vector? Unfortunately, I don't have the datetime class in my version of MATLAB so do not know if the above will work. Hey Geoff. Thanks. Just tried that option, but it didn't work. I'm in the process of trying to use datenum to see if it'll work. I used datenum and it worked with a few modifications! Thanks so much for all your help. I'm gonna go ahead and accept the answer. Glad it worked out, George! Is there a way to plot two different variables on the same axes using the method you recommended. Every time I try, it combines the results into a single plot.